Life in the mid-18th century must have been tough. Syphilis was still being treated with mercury, the roads of Britain were plagued with armed highwaymen and the internet was not to rear its head for another 200 years or so. Perhaps as a way to distract themselves from all of this the upper class Georgian was quite partial to a pun. 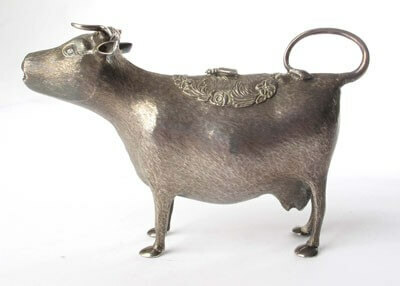 Another example of mid-Georgian humour is the cow creamer, which is a jug for serving cream with tea but disguised as a cow. First appearing on our shores in the 1750s, the connection between the form and its function is obvious. These miniature models took quite a hold on upper class households and a vast number of different models survive today. In the middle of the 18th century silver was only for those above the middle classes and consequently cow creamers were only for the very wealthy (it was only the invention of the steam hammer and the subsequent mechanisation of the silver manufactory by the likes of Hester Bateman that brought silver to the wider middle classes). 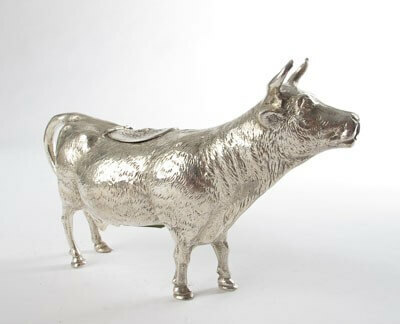 Such was the popularity of silver cow creamers that pottery and porcelain models were soon made available to the wider public. The earliest are attributed to the Longton Hall factory around the 1760s, with a proliferation of Pratt type models appearing to the end of the 18th century and early 19th century. 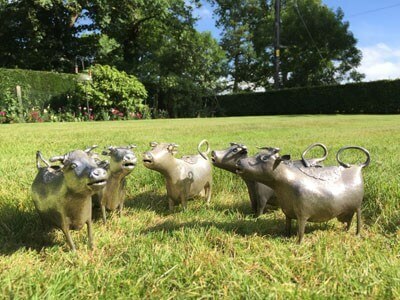 The form continued to be made both in silver and pottery through the 19th and 20th centuries, and there are silversmiths making cow creamers to commission today. Incidentally, both dummy boards and cow creamers are Dutch inventions, with Dummy boards first appearing in the 17th century and the silver cow creamer in the 1750s when one was first made by the Dutch immigrant John Schuppe. It is to his creamers that we shall now turn our attention. Little is known about John Schuppe other than that he was a Dutch immigrant and flourished in England c1753-1773. His mark was first registered in the UK in 1753, and over the next twenty years he focused solely on the production of these novelty jugs. 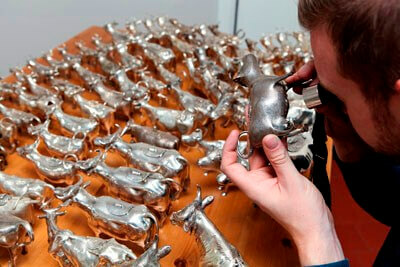 Although Schuppe was the first to make cow creamers from silver, their form is much older. To find the form in its earliest guise we would need to travel back to 4th century BC Egypt where pottery jugs in the form of cows first appear. They then reappear in early part of the 18th century in Holland. It is from here that Schuppe must have taken his inspiration, and the form which he pioneered was so popular that copies of his style of creamer were made for the next 200 years. The cow creamers that Schuppe made all had the same basic traits. The body of the cow was hollow, with a fly on the back of the cow acting as a handle to a small hinged cover. This cover is often chased with flowers or foliage. The legs of Schuppe’s creamers are always very thin and spindly, and the tail is always looped back on itself to act as a handle. The cows’ facial features are almost comical, but their overall impression is charming and this is what often draws collectors in. Their gaping mouths act as a spout so that when the cow is upturned a perfect flow of milk would appear from the mouth of the cow. All of the cows have a lock of hair to the top of their head and naturalistic horns and not so naturalistic ears. The main variables with Schuppe’s creamers is the working of the cows’ hair. Some creamers are left smooth, leaving the cow with a mirror like finish. However, the most sought after creamers have finely chased fur all over the body and legs which make the creamers look more naturalistic. Marks are always on the underside of the body in a line, and it is uncommon for the marks to be worn. Schuppe’s design was an instant hit and began to be widely copied. Although generally not as well made, these copies, which are almost always Dutch or German in origin, adhere to the same basic principle as Schuppe: spindly legs, looped tail, fly knop on the cover and broad, gaping face. More creative license is used in the chasing of the facial features on these imitations. 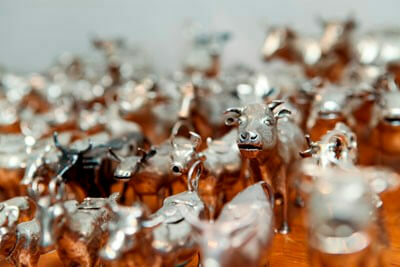 Some can only have been made in a hurry or by a silversmith who had never seen a cow close up before. Many of these Schuppe style creamers have pseudo 18th century Dutch marks, whereas some will have period 19th and 20th century Dutch marks. Some may also be found with English import marks alongside the mark of a retailer. The most popular of these Schuppe style creamers are marked by Berthold Muller who specialised in importing silver, especially that of Neresheimer & Co of Hanau. Muller creamers tend to be of better quality than other Schuppe style creamers. Features such as eye lashes and ruby set eyes make the creamers more appealing, and thus more commercial. Almost all of these Continental Schuppe style creamers are around 10cm high and weigh 5ozt. There are exceptions however and some may weigh as much as 14ozt despite being the same height. 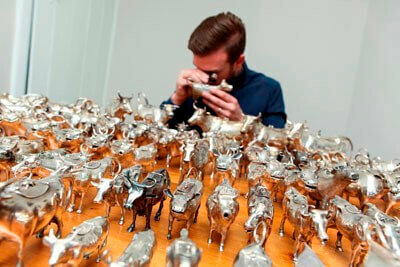 Through the 19th century efforts were made by the Dutch and German silversmiths to make more realistic cow creamer models. Their attempts were varied and I group them under the semi-naturalistic heading as they do pay more attention to small details like hooves and muscle structure. The legs are often better formed and the faces are narrower and more lifelike. These semi-naturalistic creamers can be subdivided by size. Large examples are often 10-11cm high and weight 6-12ozt. Medium examples are often 8cm high and weigh 4-7ozt. Small models are often 7.5cm high and weigh around the 3ozt, while the smallest semi-naturalistic creamers are a mere 5cm high and weigh around 2ozt. 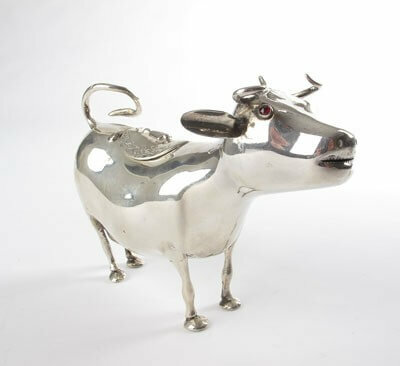 The most talented silversmiths in 19th century England used all of their skills to make the most naturalistic cow creamers to date. The cow creamers by George Fox are by all accounts the best modelled and are widely coveted by collectors. Many silversmiths did not seem to be well versed in the biological production of milk, with a number of bull cow creamers in circulation. There is a known style of bull creamer which are all stamped 800 and all feature the rather odd spout protruding from the top of the bulls head. From experience these bull creamers are notoriously poor pourers! 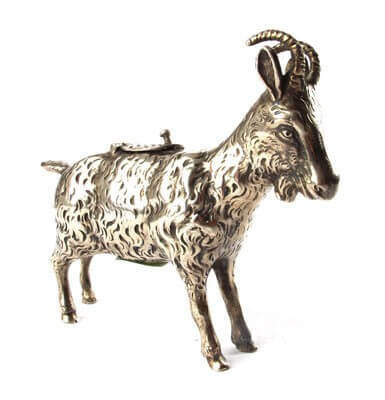 The goat illustrated is not a biological oddity but rare for simply being a goat rather than the usual cow. The last category of creamers are the oversized creamers which again, from experience, are notoriously hard to use. These creamers stand almost 20cm high and typically weigh around 30ozt. As such they are more table ornaments than they are practical creamers. They are often stamped 800 or 835 and are generally well modelled, with greater efforts made to render a naturalistic face. The most common form of faking is the ‘letting in’ of 18th century hallmarks into a 19th century creamer. These creamers have all fallen into the naturalistic style from my experience. It is quite easy to spot these fakes as the forger often paid very little attention to the maker he was substituting the marks for as they are often known flatware makers – clearly the forger was paying more attention to the size of the marks than the output of the maker. Breathing on the marks to make condensation appear around the marks will often show the shadow of the let in. Other fakes include the use of a homemade stamp imitating the marks of Schuppe – these marks are very poorly struck as the metal is not strong enough to leave a deep impression. As ever condition plays a very important role. Missing pins from hinged covers can be replaced, but worn decoration and broken legs are much harder to repair. The facial expression of the cow is very important and a happy looking cow will always sell for more than a slightly bemused looking cow. Weight and size is seldom a contributing factor, but naturalistic creamers are always popular and command a premium. English made (rather than imported) creamers also carry a premium as these are typically better made and more naturalistic. Schuppe creamers are always in demand and typically sell for £4,000-£7,000 at auction. Schuppe style creamers and large to miniature semi-naturalistic creamers often sell for around £300-£1,000 depending on the facial expression and overall quality. Naturalistic creamers with English hallmarks often sell for £700-£1,000+ with examples by George Fox selling for £2,000-£3,000. Oversized creamers are highly desirable as they can be used as table ornaments and can make £1,000-£2,000 despite them often bearing continental marks. If you would like a free, no obligation valuation of your cow creamer please use the form below. 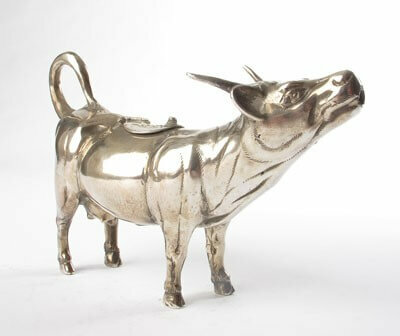 You can also email details about your cow creamer to [email protected] or call us on 01477 410893.